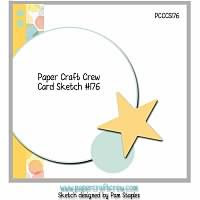 Its Wednesday once again, time for another challenge at the Paper Craft Crew. I am out of action having made this card in advance before shoulder surgery. Please forgive the last post of this card. I'm using a Base of Rich Razzleberry combined with some Floral paper from an older pack of dsp. I've used some Wisteria Wonder card for a punched border and Whisper White card for stamping onto. The Hydrangea is from a vintage Hostess stamp set, the greeting from Well scripted vintage set and the butterfly is one of my favourite from a current set called Papillon Potpourri. Come and have a look. Happy Tuesday and welcome to our Stamp Ink Paper challenge this week. This sketch was actually designed by me, but I did have a little help from the team to convert it to a digital format so as to look a little more professional. I've made my card in advance because by this stage my arm will be in a sling due to shoulder surgery I had in the New Year and I will be out of action for some time, weeks in fact if not a month or more. I'm using Floral patterned paper from English Garden for my background, combined with cardstock of Island Indigo, Whisper White and Rich Razzleberry. Stamps used are Papillon Potpourri Butterfly set and Well Scripted vintage set for the greeting. The seam binding ribbon is some vintage Pool Party from my stash. Thanks so much for stopping by today. 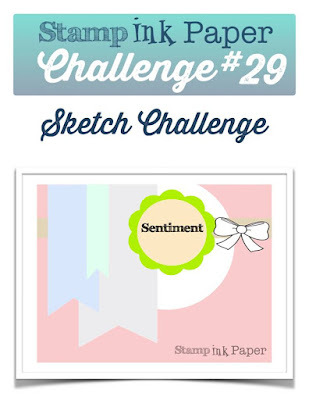 We hope you will join us this week at Stamp Ink Paper for the sketch challenge. I've had to make my niece's Birthday card a little in advance, simply because I'm having surgery tomorrow and I won't be able to create afterwards for quite a few weeks. I've dug into my stash of stamps and found this Cherry Cupcake image which I've coloured with Blendabilities and combined it with some Stampin Up papers and a new greeting stamp from the upcoming stamp set called Rose Wonder. Here is a closeup. The cardstock I've used is Real Red, Pool Party, Basic Black and Whisper White. The patterned paper comes from the Mosaic pack. Happy New Year. I hope you all enjoyed your Eve or your day. After staying up late last night to see the New Year in, I had a quiet and relaxing day today, even fitting in a nap. Today's card uses up some pieces that have been cluttering my desk. I dare not actually show you a picture of my desk, lol. I've used the Fluttering Embossing folder for the background of my card and combined it with Lots of Labels framelits and Bold Butterfly thinlits. The cardstock used is Night of Navy, Whisper White and Crumb Cake cake. The greeting comes from the Expressions Natural Elements pack. This was a very CAS card but I like those every now and then. Thanks so much for stopping by.